Are you a nervous public speaker? 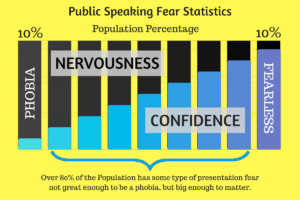 A majority of the population has some type of fear of public speaking. Ironically, a great deal of this nervousness or anxiety comes from well-meaning friends or coworkers who are just trying to help. When we see a friend struggling, we naturally want to help. So, we might offer a little constructive criticism as a way to help a new presenter improve his/her public speaking. However, these "helpful" pieces of advice can actually have an extreme negative effect. This session shows how constructive criticism can actually cause public speaking fear. We'll also cover a few ways to reduce this nervousness when we coach or mentor a nervous speaker. Public speaking is not unlike any other new skill in that when we try to speak in front of a group for the first time, every one of us will be nervous. This nervousness is just like the nervousness you felt the first time you used a computer. It's also similar to the anxiety that you felt the first time you drove a car, or the first time that you rode a bicycle. Each of these experiences have a risk of danger, so the first time that we try them, we experience fear. What happens next, though, usually determines whether the first-time speaker will gain confidence or become more nervous. Glossophobia definition: An abnormal fear of speaking in public or of trying to speak. So, how pervasive is glossophobia (the fear of public speaking)? 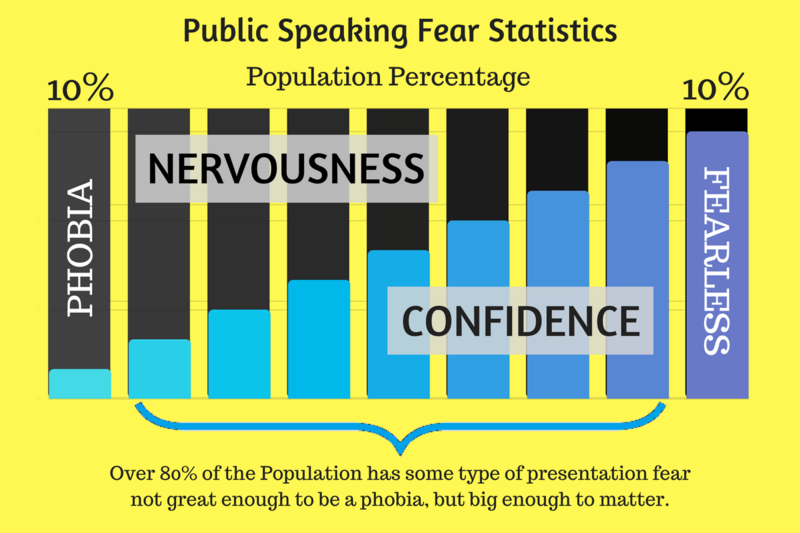 Are there any true fear of public speaking statistics that can be cited? The woman who trained me to be a public speaking coach told me that as much as 95% of the population has some type of public speaking fear. Since she had so much more experience than I, I assumed that she had come across that statistic in a study somewhere, but I never asked. I just kept quoting her. When I wrote Mastering Presentations, though, I decided to do a little more research. I've come across studies ranging from a high of 95% of the population down to as low as 7% of the population. The range is huge based on the type of nervousness the study is tracking. For instance, Peter Khoury, a public speaking coach, wrote an article called 7 Unbelievable “Fear of Public Speaking” Statistics where he states that an average of about 7% of the population has a social anxiety related to public speaking. Khoury sourced this statistic from the Social Anxiety Institute. I agree with Khoury. The number of people who have a fear large enough to be called a phobia is quite small. Interestingly, though, Khoury calculated that percentage versus the population of the US, and realized that at just 7% of the population, 27 million Americans have a fear of presenting so great, that psychologists call it a phobia. Statistic Brain conducted an online survey where 74% of the respondents admit to having a speech anxiety. The best explanation that I found, though, was from Nick Morgan in his Forbes article entitled Why We Fear Public Speaking And How To Overcome It. Morgan starts the article by saying that, in his experience, about 10% of the population love speaking in front of people. In fact, they thrive on it. About 10% are terrified of it. And the remaining 80% of us fall somewhere in the middle. I tend to agree with Morgan. Any time we try something new and have what we consider to be a success, we gain confidence in that skill. Any time we try something new and feel like we failed, we diminish confidence. Think about the process of learning to speak in front of a group like the process that we use when we learn to ride a bicycle. When a kid hops on a bicycle, rides for a few yards, then falls over, the Mom or Dad, usually says something like, "Look how far you rode! Let's see if you can go farther next time," not "You did good, HOWEVER, toward the end there, you really tapered off, so you should probably keep pedaling a little longer and make sure you keep a firm grip on the handlebars, and oh yeah, by the way, you looked a little shaky, so keep your posture upright so you can have better control of the bike." HOWEVER, that's the way most friends and coworkers coach speakers. We tell the speaker something good, but then we follow up with either a BUT or a HOWEVER. What that tells the speaker is, "What I just told you was just to make you feel better, BUT here is how you really did." According to an article titled Anxiety, Criticism, and Conquering Self-Doubt written by Tanya Peterson, "The criticism isn’t the source of our discomfort. Anxiety and self-doubt arise because of how we interpret the criticism." A seasoned presenter will be able to accept this type of coaching more positively. He or she may not like the criticism, but the seasoned speaker will likely have enough successes under his or her belt to use the criticism as a corrective device. A new speaker, though, will most likely reduce his/her confidence and focus primarily on fixing the problem instead of presenting well. For instance, if a new speaker is told that he or she said "Uhm" too many times, this new presenter will focus on not saying "uhm" instead of on presenting his/her talk well. Consequently, the speaker will most likely say "uh" more often. This happened to me in college. I took a business communications class where my entire grade was an average of the scores that I received for three separate presentations. I did pretty well on the first presentation. I got a 94 out of 100. However, after I spoke, the graduate assistant who was teaching the class gave me constructive criticism telling me that I said "Uhm" seven times throughout the speech. She said that I should work on that. So, the next presentation, I spent more of my practice time focusing on not saying "Uhm" and less time focusing on the actual presentation. I got an 84 on it. I said "Uhm" 14 times. The third presentation, I got a 74. This is actually a very common challenge. After I finished the third presentation, my confidence was pretty low. From my experience, every time I gave a presentation... I got worse! Consequently, three months later, I gave the presentation that I told you all about in podcast #1 (10 Ways to Eliminate Public Speaking Fear) where I totally bombed my first professional, business presentation. "All-or-nothing thinking: Also called black-or-white thinking; this thinking pattern contributes to perfectionism and thus anxiety and self-doubt. With this, if performance isn’t perfect, it’s worthless. 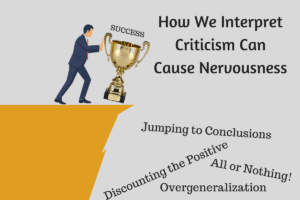 "Overgeneralization: People with social anxiety and fear of criticism often take one critical comment and equate it with complete and total failure. Self-doubt comes from not separating criticism from positive feedback. "Jumping to conclusions/mind reading: Social anxiety makes us, consciously or subconsciously, watch people for nonverbal communication of critical opinions. We mind-read, assuming that someone is inwardly critical of us. "Discounting the positive: This is “yes-butting.” Someone might be giving us positive feedback, but we dismiss it with self-doubt, believing we’re really not worthy of the praise. Or we ignore all positive comments and instead dwell on that one criticism we received." And there are dozens more. Just remember that when someone is trying something new, you never want to criticism them too early. Look for the positive. Identify their strengths, and help them build on these strengths. Save the critiques for a time when the speaker has a few successes under his or her belt. The analogy that I like to use here is to think of the person's confidence as a bank account. Every time the person has a success in the new skill, he or she is making a deposit into the bank account. Every time the person has a negative experience, some of the balance is withdrawn. The challenging thing with these deposits is that it takes a bunch of them to make up for a single withdrawal. That is why so many speakers look for help from an expert. A good coach can minimize the chance of failure. So, if the person can have a series of successes in a row, then an occasional hiccup doesn't destroy the confidence. Just remember, the best type of coaching you can give a new speaker is to tell them they look natural and confident (if that is a stretch, tell them how much courage they have.) Let them get comfortable speaking a few times and have a few successes in front of a group. After a few successes, a lot of the menial nervous ticks and symptoms will start to diminish. When the trust is high between you and the speaker, and he/she knows that you think he/she is confident, then you can begin to offer a few constructive comments a little at a time. So wait for the balance in that bank account to be high before you start to make withdrawals. About a year or so after I started working in the training industry, my boss asked me and one of my coworkers to help him put together a presentation for the company annual convention. So, the three of us met in the meeting room the day before the convention, and we brainstormed and practiced the presentation. Oddly, my boss had my coworker and I practicing parts of the presentation with him. After working with us for a couple of hours, he looked at us and said, "I think you are ready." My coworker and I looked at each other and then at him, and said, "Ready for what?" "Well to give the presentation, obviously." We were confused, but that was his plan all along. He worked with us for hours until we were flawless, and he never let on that it was actually us preparing, and not him. We didn't have weeks to think about what we'd say or how we'd say it. We just developed a great presentation. However, as I started speaking, my preparation took over. I got right into interesting information, and my natural energy kicked in. About two minutes into my speech, I looked at one of the audience members in the front row. He was making the "okay" signal with his hand and he was silently mouthing the words, "You are doing great!" I spoke a little longer, and I looked at a different person in the front row who was whispering the words, "Fantastic! Keep going!" Before long, the entire front row was in on the action. "Great!" "Good job!" "Your awesome!" I had so much fun. I was hooked. I had moved from being a shy and nervous speaker to a professional motivational speaker in a matter of minutes. The moral of the story is, if you are a nervous public speaker, hire 10 professional speaking coaches to sit in the front row of your first big speech. Since most of us can't do that, though, a class with a single professional coach and about nine other speakers who will give you encouragement will do. That is what people experience when they attend the two-day Fearless Presentations ® class! A list of upcoming classes is in the sidebar to the right! We'd really like for you to attend one of these upcoming classes! Make sure to subscribe to the podcast to access new sessions when they are released.